Deep Space Station 33 (right) was an 11-metre diameter antenna at the Complex. Recycled, it now stands on an island near Norway. 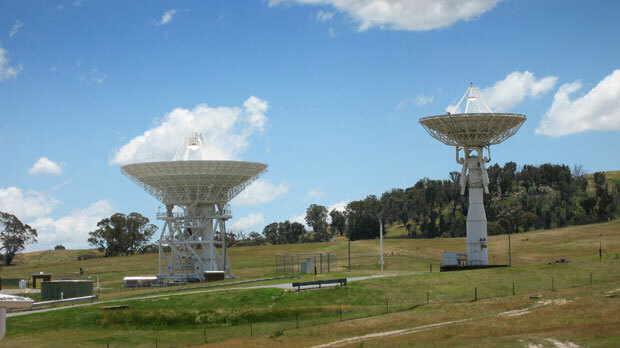 Deep Space Station 33 (DSS-33) was built for a radio astronomy role. Construction of the antenna commenced on 22 February 1994 and it became operational on 7 June 1996. It was built to support space Very Long Baseline Interferometry (VLBI), working with Earth orbital observatories to simulate one large antenna thousands of kilometres across the Earth. It supported the Japanese HALCA (Highly Advanced Laboratory for Communications and Astronomy) mission. A proposal by the Russian space program to utilise the antenna as a part of a cooperative space-based VLBI project known as RadioAstron did not eventuate though a version of RadioAstron was launched in 2011. DSS-33 was dismantled in 2008 and its parts shipped to an island off Norway where it was rebuilt to assist in conducting atmospheric research.